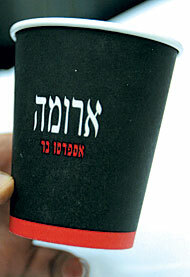 JEDDAH, 22 August 2005 — Paper cups with Hebrew writing disturbed both employees and medical staff at King Khaled National Guard Hospital on Saturday. The catering subcontractor for the hospital coffee shops began using them on Saturday after their usual supply ran out. Al-Musbah later contacted Arab News and said that the paper cups had come to his company by mistake. The cups were in a cardboard box that looked exactly like the ones his company normally receives and so the employees did not notice any difference. Al-Musbah added that the supplier was named “Jeelani” and that he would supply Arab News with his contact numbers today. A hospital in Dubai returned Dh200,000 worth of medical goods including physicians’ and patients’ uniforms, bed sheets, pillows and towels made in Israel, a source said. The hospital source, who spoke on the condition of anonymity for himself and the hospital involved, said: “While going through the goods to check the quality and quantity, hospital administrators were shocked to find tags reading ‘made in Israel’. I've been to the cafeteria that makes those cups on occasion. It's amazing that they actually turned up in an Arabic owned hospital. For years freedom loving Western companies have being signing contracts with Muslim (especially Arab) countries by which they promise not to trade with Israel. Some have disobeyed as we can see. While they are at it, why not chop off all arms infected with 'jewish' polio vaccine (Salk was a BIG jew).